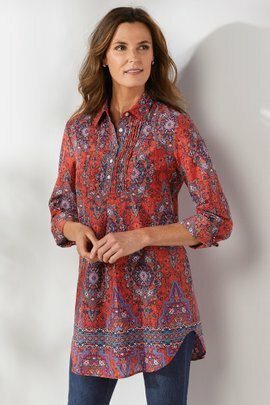 Our women's tunics are some of our bestsellers here at Soft Surroundings. Universally flattering, tunics bridge the gap between formal and casual. They pair great with jeans, leggings, and skirts, making them incredibly versatile.Styles run the gamut from simple to ornate. Solid color tunics and tunic sweaters stand on their own or can be paired with jewelry or a great jacket. If you're looking for something more elaborate, several of our styles incorporate distinctive embellishments such as embroidery, beadwork, and tie-dye.As you might expect, we carefully choose the fabrics and textiles that all of our tunics are made from. From exquisite crushed velvets to buttery suede to soft silks, you will be able to create the exact look you want. Of course, all of our tunics have been assigned to softness rating, so you'll be able to select the garment that gives you the comfort you need and deserve.